« Move Over IPhone, Android Has Great Health and Fitness apps too! As you may have realized by now, I am a big promoter of hiking and exercising in the great outdoors. In 2010, technology and nature collide (and I am not taking about the oil spill, that’s a whole other story). Now smart phones like the Android, Blackberry and iPhone allow you to map your hiking and backpacking trails using GPS and geotagging. • Hiking the Grand Canyon Rim-to-Rim click here. • Half Moon Bay Coastal trail, CA click here. • Kayaking Around Pennisula State Park’s pennisula in Door County Wisconsin click here. • Backpacking North Country Trail, Brule River State Forest, Drummand, WI click here. • Danada Forest Preserve and Heron Rookery, Wheaton, IL USA click here. • Busse Woods Bike Trail – Illinois, click here. • Chicago City Walk vs The Field Museum – Illinois click here. Wow. This is terrific. Thanks. 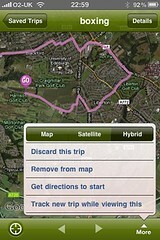 I’ve tried a couple of these gps apps for my berry including one for money and neither of them worked this well. slick app!